A slap in the face for the Windrush generationMany Windrush migrants who have had their legal status called into question have been in the UK for decades, often paying taxes and making pension contributions.It seems intuitively that anyone living and working in a country for a long period will leave a significant paper trail. So why are some finding it so difficult to prove?Part of the problem has been a requirement to provide four pieces of evidence for each year that a person has been in the country. 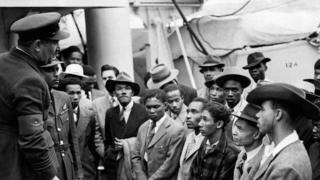 Windrush migrants must prove they have been in the UK since 1 January 1973, when they were granted the right to stay in the country permanently. The Home Office did not keep records of the people to whom it granted indefinite leave to remain in the 1970s. Some stayed but did not apply for British citizenship meaning there is no official record of their legal status. To gain this official recognition, people must apply for an official stamp known as No Time Limit (NTL), at a cost of ?229. The Home Office has put the onus on the individual to provide evidence.It has not been using central tax and pension records that would prove someone has been working to support their application. Instead, the current system relies on people having kept their own documentation including payslips and bank statements dating back to the 1970s. Changes to the immigration system during Theresa May's tenure as home secretary clamped down on people living in the UK illegally by introducing new checks aimed at restricting their access to work and public services like healthcare, benefits and housing. The Immigration Act 2014 introduced requirements on landlords, employers, banks and the NHS to check the immigration status of people trying to use these services. The Advertising Standards Authority banned a Home Office mobile advert telling illegal immigrants to "go home or face arrest". These requirements were made more stringent in 2016.Some people who arrived legally decades ago are being caught out by these checks when they try to rent a house or get medical treatment, but aren't able to prove their status. The Joint Council for the Welfare of Immigrants' head of legal and policy, Chai Patel, told BBC Reality Check that while in theory there is flexibility in the guidelines, this is not how it has been applied in practice. Timothy Lawrence, a solicitor for the Southwark Law Centre, said: "The approach has, for many years, been to refuse to accept any claimed period of residence in the absence of independent documentary evidence covering the entire period of the claimed residence, with no benefit of the doubt given. "One of my clients who had lost the passport she used to enter the UK as a child with indefinite leave was refused confirmation that she had retained that status in spite of her having supplied the Home Office with a copy of the passport," he added. There have been several cases of people who have been refused NHS treatment, detained in immigration centres and almost deported in the case of Paulette Wilson, who was taken as far as Heathrow before her MP intervened. However, there appears to be some confusion in government over whether anyone has actually been deported. Although there are figures available for deportations (there were 12,321 enforced returns last year), it's not possible to tell from these whether any were Windrush migrants.Immigration minister Caroline Nokes told the BBC's Daily Politics programme that the system would now change: "We are not asking them for four proofs of evidence that they have been here for, for every year that they have. "She said that the Home Office would work with the tax and benefits authorities to "establish those records which may not be available at first hand to the individuals concerned".